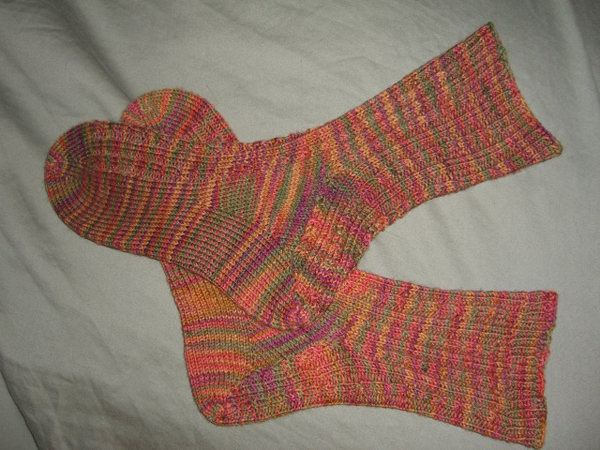 The Gold Hill Socks that I started just before going to Las Vegas are finished, finally, and here they are! I wrapped these up last night, mostly at Tangle Thursday knitting night, but a bit after I got home, too. This is Lorna’s Laces Shepherd Sock in the colorway “Gold Hill.” I knit them on US#2 Inox Gray needles. The pattern is basically a 2×2 ribbing, but every other knit pair of stitches is twisted in baby cables every 5 rows. I made these to be “clog socks.” The 2×2 baby cable pattern continues on the heel flaps. I’m rather proud of the way the cables twist over the ends of the gusset rows. Not bad, eh? I’ve heard of others having problems with Lorna’s Laces pooling. These did pool a little over the instep, but when on it’s not very noticeable. On the whole, I’m pleased with the way the colors knit up. This was my first experiment with this yarn. Even though I swatched (really!) I made about three false starts with the gauge too big before settling on 64-stitch rows. I have skinny feet, and the socks are still a little big and the heel could be shorter. But I don’t care. I’m wearing them anyway. I’ve started a new pair of socks in the “Vera” colorway, and I’m going to try 60-stitch rows. That should be just about right, I think.